alaTest has collected and analyzed 59 reviews of Panasonic SDR-H90. The average rating for this product is 3.8/5, compared to an average rating of 4.0/5 for other Camcorders for all reviews. People are impressed by the size and zoom. The price and usability also get good views. The battery and image quality get mixed comments, while some have doubts about the color and viewfinder. We analyzed user and expert ratings, product age and more factors. 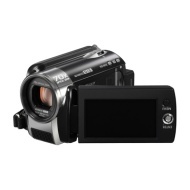 Compared to other Camcorders the Panasonic SDR-H90 is awarded an overall alaScore™ of 83/100 = Very good quality. alaTest has collected and analyzed 24 user reviews of Panasonic SDR-H90 from Amazon.co.uk. The average user rating for this product is 4.0/5, compared to an average user rating of 4.0/5 for other Camcorders on Amazon.co.uk. People are impressed by the price and size. The zoom and usability also get good views, but many are less positive about the viewfinder and image quality. A compact little camcorder with a mighty optical zoom. great quality images, eay to use, light and compact, great value for money. Cannot buy a spare battery at present. The sotware does not give you the ability to print of still photos directly. The hybrid camcorder SDR-H90 can record either on its built-in hard disk drive or on SD/SDHC memory card. Besides the high capacity HDD the SDR-H90 camcorder features a powerful 70x optical zoom combined with an advanced optical image stabilization system that corrects hand-shake around 4,000 times per second. The SDR-H90 camcorder features the YouTube Uploader function that makes video uploading super easy! Simply set the camcorder to "Web Mode" and it will record the movie in a YouTube compatible format. After shooting connect the camcorder via USB to a PC and the YouTube Uploader automatically starts. Simply follow the procedure to upload your video clips to the YouTube video-sharing site. The SDR-H90 camcorder offers a function that simplifies the process of copying recordings from the memory card or hard disk drive to a DVD. No PC is required. A DVD disc created this way can be easily played directly from a DVD player.